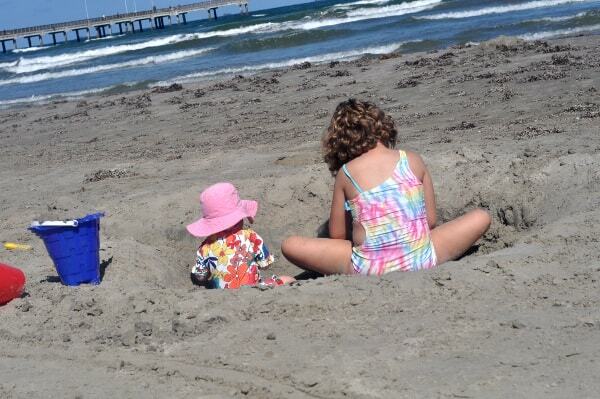 Home»All»Things to do in Port Aransas, with kids! We recently had a chance to spend a couple days in Port Aransas, Texas. I am certainly not an expert on all there is to do… but we did our best to explore this small town on Mustang Island by Corpus Christi! Here are our favorite things to do… with a map at the bottom. I also added the reader recommendations for our next trip. Tell us what to add! 1. Port Aransas Ferry – To get to the island, we took the ferry. It is a super short ride (just a couple minutes), but we did see a couple dolphins in the water! On the way to the island, the wait was 45 minutes (on a Sunday). On the way home, it was 20 minutes. You can see current wait times HERE. 2. Roberts Point Park – Located right next to the ferry landing, this was our favorite spot. 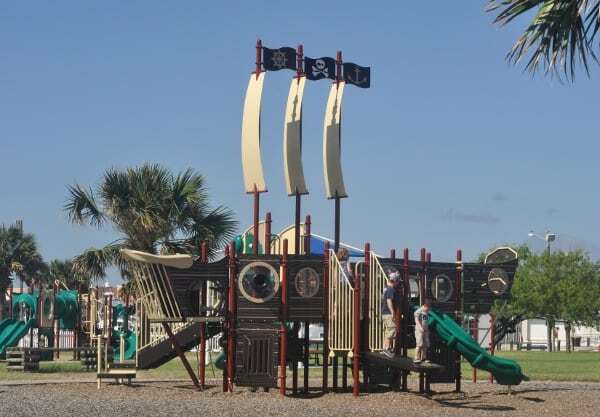 There was a cool pirate ship playground and from the pier we saw sea turtles and dolphins! This park also has pavilions, restrooms, an observation tower and a lighted fishing pier. 3. 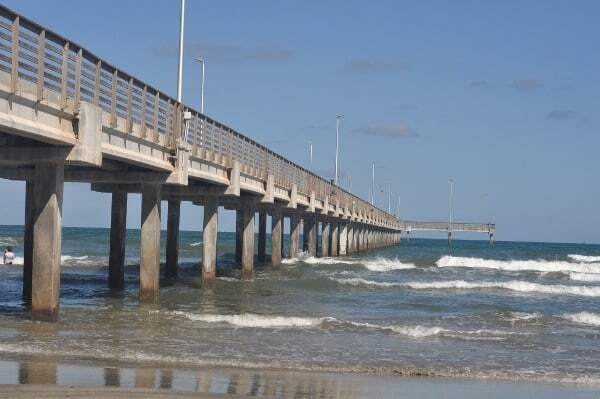 Nueces County Park Beach – This giant beach has free parking and lots of room to play! We first went to a beach at the end of Avenue G (by our hotel) but had not picked up the $12 permit from the local shops… so we kept looking and found this one. No permit was required at this county beach… and there were tons of shells and lots of space to play. These beaches were also prettier than most by Houston… lighter sand and bluer water! 4. Golf Carts – I kept on looking for a downtown pedestrian area… but never found one. That’s when I figured out why everyone had rented golf carts. They rented houses and hotels and then took their golf carts anywhere they wanted to go. We did not rent one, but we might have been the only ones. 5. 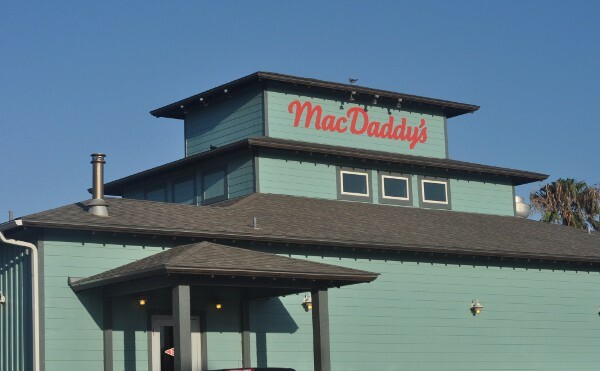 MacDaddy’s Family Kitchen – We ate at MacDaddy’s and it was cool and family friendly. I’d say that Houston does BBQ better… but it was a good stop. See some other reader suggestions below! 6. What Else to Try – Here’s what others have recommended for our next trip! Sugar Land Skeeters Baseball, Playland, Splashpad and Carousel at Constellation Field! Things to Do in Houston, with Kids… Posts on BigKidSmallCity, Published July 1-7, 2017! 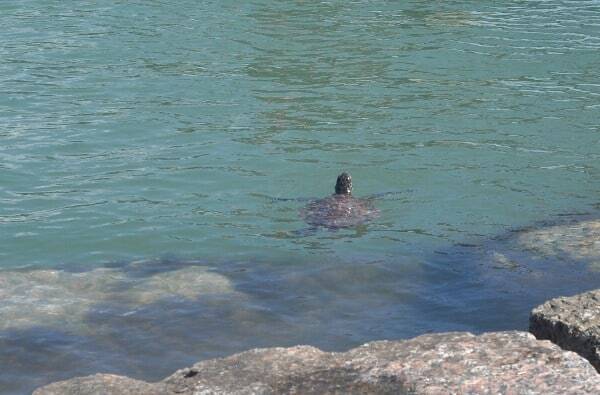 We were there a few weeks ago and came across The University of Texas Marine Science Institute. It is a quiet, interesting, and FREE facility. It was a great stop for the kids in the afternoon when it was so hot outside to do much else!